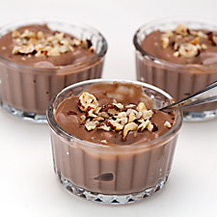 A nice creamy chocolate dessert to end the week with. Portion: 6; Preparation time:00:20; Cooking time: 00:20. 1. In a saucepan, heat milk, careful not to let it boil. 2. In a small bowl, dilute cornstarch in a little cold milk. 3. In a separate bowl, whisk egg yolks with sugar. Add cocoa and milky cornstarch. Add hot milk and stir. 4. Put mixture into pan and cook over low heat, stirring until thickened. 5. Pour mixture into ramekins. Sprinkle chopped hazelnuts over cream. Refrigerate for 1 hour before serving. Hi Diana...it does doesnt it...so simple too. 5 Easy Stretches You Can Do at Work.